Market demand for Distributed Resource (DR) products such as PV inverters and wind energy systems is steadily growing as the world strives for clean renewable energy sources. This demand has created a need for rigorous regulation testing to standards such IEEE 1547 / IEC 61000-3-15 / IEC 62116 ensuring proper and safe operation of on-grid products. It has become critical to manufacturers to conduct these tests to prove compliance and to relieve product liability concerns. Chroma’s new 61800 family of Grid Simulators has been designed to fulfill these test requirements by providing a full 4 quadrant, fully regenerative, grid simulator with advanced features for compliance, safety and product verification testing. The 61800 Regenerative Grid Simulator is a full 4 quadrant, fully regenerative, AC power supply designed for common electrical product testing such as home appliances, and industrial electronics needing a programmable input source. 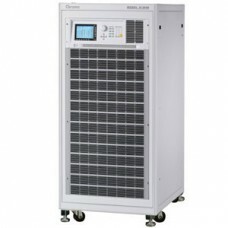 In additional, the 61800 is design to simulate grid characteristics for testing PV inverter and on-line UPSs. As shown above, power can be both sink and source from the UUT seamlessly for to support different types of applications. In cases where the UUT sources current a detection circuit will sense the excess power and recycled it back to the grid. The 61800 grid simulator could also meet test requirements with smart grid and EV related test applications, such as Vehicle to Grid (V2G) and Energy Storage System (ESS) testing. The 61800 regenerative grid simulator is not only limited to product development during R&D. Its extensive features are also valuable during design and quality verification as well as throughout various production stages. Using state-of-the-art digital control technology the 61800 can deliver up to 300VAC at output frequencies ranging from 30Hz to 100Hz. The AC+DC feature allows for applications which require a DC offset bias. 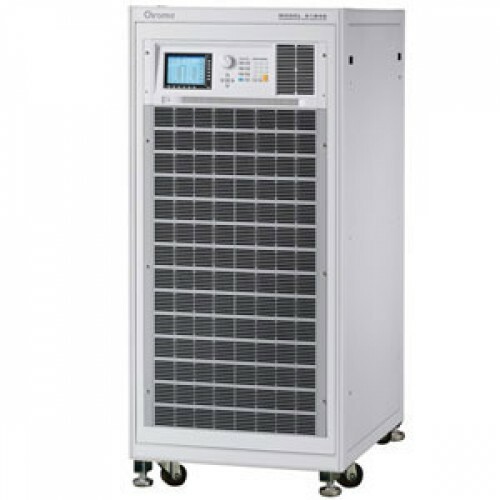 The 61800 Regenerative Grid Simulator is capable of simulating various test conditions such as voltage distortion, frequency variation, etc., in order to meet the Micro Grid test requirements. Most importantly, the regenerative feature of 61800 series product can sink the power generated by the Discrete Generator (DG) on the micro Grid and feed the power back to the main grid. The input side of 61800 series product has been specifically designed to be isolated from the main grid. Hence additional isolation for Discrete Generator (DG) on Micro Grid is not required. In addition to supply clean, precise and stable AC voltage for regular applications, the 61800 is capable of simulating various types of distorted voltage waveforms and transient conditions required by product validation testing. These are accomplished as shown below using built-in programmable waveform functions such as LIST/STEP/PULSE modes. The STEP and PUSLE functions allow users to perform single or continuous step changes of output voltage. While the LIST mode is a more versatile function as it allows users to compose complex waveforms of up to 100 sequences. Voltage waveforms required by immunity specifications such as IEC 61000-4-11 (short interruption and voltage dropout) can easily be achieved by the 61800 Regenerative Grid Simulator. The SYNTHESIS function allows users to create periodic harmonic voltage waveforms of up to 40 orders based on a 50/60Hz fundamental frequency. The INTERHARMONIC function allows users to perform frequency sweeps ranging from 0.01Hz to 2400Hz on top of the 50/60Hz fundamental frequency. This special function assists users in locating the resonance points. The 61800 series is also able to provide precision measurements such as RMS voltage, RMS current, true power, power factor, current crest factor and many others. By applying advanced DSP technology, the 61800 can easily simulate power line disturbance (PLD) using LIST, PULSE and STEP modes. Additional features such as the waveform synthesis function allows users to program various distorted harmonic waveforms which are required by some regulatory standards. GPIB (IEEE488.2), RS-232, USB and Ethernet interface are available to control the 61800 grid simulator remotely.